Although I am writing this well into the fall season I wanted to provide you with the information well in advance, so you can consider planning an activity for next spring or summer. Earlier this fall I took my adventurous daughter, tree top trekking in Barrie, as she wanted to try something new. Tree Top Trekking offers guests a challenging obstacle course above the ground, where customers travel from tree to tree. Some of the obstacles include: jumping through tires, walking across high wires / ropes and swinging on zip lines. 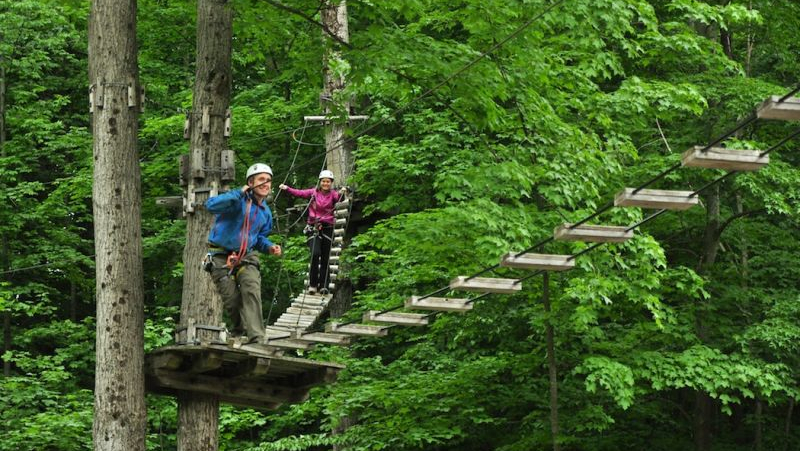 Throughout the ropes course, customers are strapped into a harness so they won’t fall to the ground if they slip or miss a jump. If a customer falls, they just hang there until they pull themselves back onto the obstacle course. Some of the courses are relatively easy while others are quite challenging, and you can choose which ones you want to complete. Some of the obstacles require you to be in really good shape while others are good for beginners. The courses could be completed by someone as young as nine, as well as adults…it has something for everyone! The best part of it, is that it’s a good workout and really fun! Since our daughter had such a great time, we decided to take some out of town guests to another Tree Top Trekking location in Huntsville. Much to our surprise, the Huntsville location was also owned by the same company. Tree Top Trekking is a very well-run operation. They offer great services and make safety their number one priority. The staff are well trained, helpful and knowledgeable. If participating in obstacles high in the sky isn’t your thing, Tree Top Trekking offers other experiences for you to choose from, but if you are looking for something different to do, and want to spend time outdoors in nature, get outside and try this.